One of the great late period films by Sacha Guitry – the total auteur who delighted (and scandalised) the French public and inspired the French New Wave as a model for authorship as director-writer-star of screen and stage alike. In every one of his pictures (and almost every one served as a rueful examination of the war between the sexes), Guitry sculpted by way of a rapier wit – one might say by way of "the Guitry touch" — some of the most sophisticated black comedies ever conceived... and La Poison [Poison] is one of his blackest. Michel Simon plays Paul Braconnier, a man with designs on murdering his wife Blandine (Germaine Reuver) – a woman with similar designs on her husband. When Braconnier visits Paris to consult with a lawyer about the perfect way of killing a spouse – that is, the way in which he can get away with it – an acid comedy unfolds that reaches its peak in a courtroom scene for the ages. From the moment of Guitry's trademark introduction of his principals in the opening credits, and on through the brilliant performance by national treasure Michel Simon (of Renoir's Boudu sauvé des eaux and Vigo's L'Atalante, to mention only two high-water marks), here is fitting indication of why Guitry is considered by many the Gallic equal of Ernst Lubitsch. 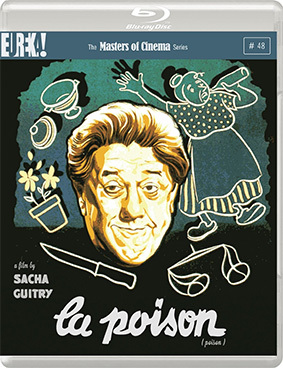 La Poison will be released on UK Blu-ray and DVD on 25th February 2013 by Eureka as part of the Masters of Cinema series at the RRP of £20.42 for the Blu-ray and £18.37 for the DVD.